The fun and smarter way to best enjoy your sparkling drinks at home. 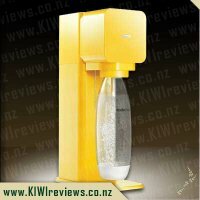 Just fizz your water, add your favourite flavour and enjoy the refreshing sparkling taste. Makes 12 litres of Blackcurrant. WOW, WOW WOW. 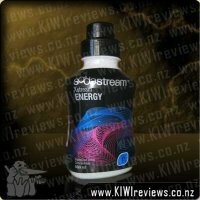 That is my thought of the Sodastream Blackcurrant flavour. I love blackcurrant drinks and have quite often mixed it with soda water or lemonade to get a fizzy drink, but now I don&apos;t have to do this. I didn&apos;t know what to expect when I tried it but the colour and smell made me think I was really eating them. One worry would be it would be too sweet and fake, no worries it was as natural as you could get. Because it smelt so good I tried it undiluted and it actually tasted pretty good, so much so that I tried it as a warm beverage that night. All I did was warm up water and pour some in to my taste level and I have to admit it was good. This will be on my shopping list in the future and I can&apos;t wait to introduce it to others so they can become addicted to it as well. 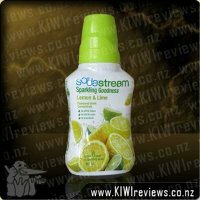 This is my hit-pick for Sodastream syrups at present. In my wilder days at Uni, my drink-of-choice was a pint of cider with a hefty dollop of blackcurrant in it - tasted like sparkling ribena, and got me pissed after the 6th one... but between the 2nd and 4th pint I was near unbeatable at air-hockey, and could usually hold my own on the pool table until the 5th pint was down... after the 6th it was time for the scary dancing! 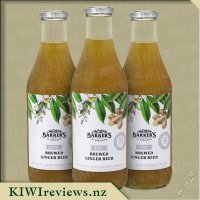 So, having a few bottles of cider in the fridge at any given moment, I pulled a pint of one, added a shot of this syrup directly, and gave it a quick stir before I sat down to enjoy the last of the season&apos;s BBQ meals with my family. 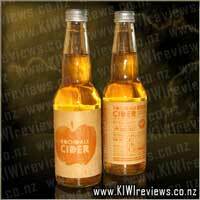 I must say, this brought back many pleasant memories and really made the cider much more than the sum of it&apos;s parts. Trying this syrup in still water didn&apos;t give much joy - it was drinkable, but really didn&apos;t have any life to it. Of course, putting it into carbonated water gave it a lot more oomph as it is designed to do. However, using this syrup to make cupcake icing was a stroke of delight... because it&apos;s a syrup, I didn&apos;t need much to make a thick, bright purple, delightful smelling and tasting icing to go atop some fruity cupcakes, and it also went well atop a banana cake too. Overall, 12L of drink for a little over $0.54 per litre is exceptionally good value for money in anyone&apos;s books. I don&apos;t think it would be likely to find any such drink available pre-made on the shelves. 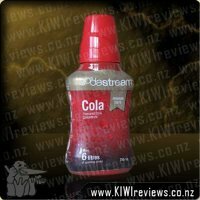 Overall, probably my vote for this year&apos;s winning flavour from Sodastream! This Blackcurrant flavour is amazing....it&apos;s deep vibrant colour and blackcurrant smell make this drink appealing to all the senses! 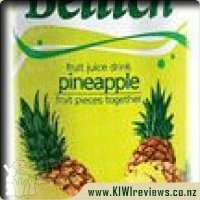 The taste is out of this world as well...and usually I am not a huge fan of fruity flavoured drinks but this is definitely a nice and refreshing change for me. My nieces who are fans of blackcurrant drinks got excited when they saw the bottle in the cupboard and wanted to make up some to try it, and since then blackcurrant has been their only request, and when the blackcurrant soda-stream is made up it does not last very long, and a request for a new bottle to be made up is made by my nieces. I tried the syrup by itself before I poured the syrup into the carbonated water and it tastes just as good without the fizzy water, but I do prefer it with the fizzy water once the syrup was added. I put in the full required amount as I wanted to taste the flavour as it is recommend but I did find it sweet (as I do with most of the flavours) so when I made the next bottle I added less flavour and perfection! 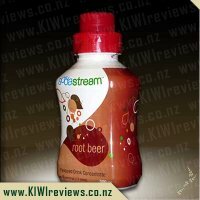 Even my nieces who are sugar fanatics prefer it with less syrup...I guess each to their own though and that is great thing about soda-stream it can be custom made! After reading the other reviews I would like to try the blackcurrant syrup in a cup of hot water...great thing for all the winter weather that is on it&apos;s way, and I am not a fan of tea or coffee so this blackcurrant hot drink sounds like it would be right up my alley. I will definitely be buying more of this flavour when this bottle runs out. I can easily describe this flavour in only 7 letters: A, W, E, S, O, M, E! 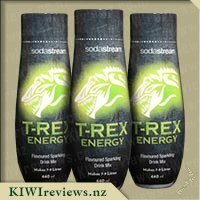 Out of the two flavours I was recently given to review, this one ROCKS! It has a very sweet flavour, it really is quite appetizing. 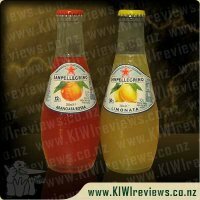 I would prefer this over the Ginger Beer when I am more in the mood for a fruity drink instead of a tangy, ginger drink. 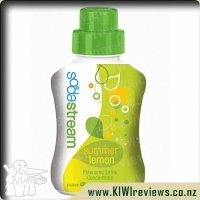 I you take away the fizz, this drink is actually a lot like the blackcurrant drinks you get at McDonald&apos;s.
This is proof that the guys at Sodastream have managed to hold in the same, delicious fruit flavour without drowning it out with anything else. When I first opened the bottle, shortly after pouring in the concentrate I gave the lid a bit of a lick (hey, laugh if you want, but just know that I couldn&apos;t help it) and found that on it&apos;s own, the concentrate was even more delicious that it is when put into the fizzy water! The colour of the drink was quite dark and rich, and you know what they say, colour is flavour, so I was able to sit down and enjoy a drink that didn&apos;t have most of the taste coming from the water rather than the syrup. The Price is good, like so many things I have had to review it matches the value of the product unfathomably well. Flavour is pushing right up against the 10/10 marker, if it were possible I would give it an 11! The bottle I got has got a different label design to the on shown in the picture on this review page, it has got a picture of some berries on it, so it is nice to see the label makers spicing things up a bit! All in all, great work Sodastream! 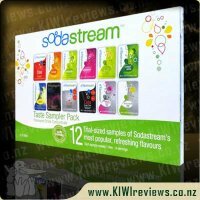 I love sodastream and was really excited to be selected as a reviewer of the sodastream sample box, gingerbeer and the blackcurrant. There are some flavours that outshine others and I must admit this blackcurrant flavour is one of them. I am glad that this makes 12 litres, but must admit even that was not enough, and within one week we had run out (that right there is a lot of fizzy water!! ), but it&apos;s just so yummy. So I had to go on the blackcurrant hunt in order to replace. This one rates very very highly for me, and is currently my favourite flavour. It is in my opinion the best, pushing my original cranberry flavour in to second place. Definitely worth trying if you haven&apos;t yet. Yum yum yum. I love blackcurrant, hot or cold I usually have some kind of syrup in the house. So when I got the opportunity to review this I was rather excited. 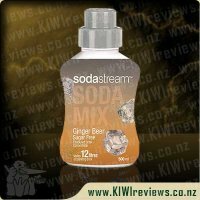 I tried this flavour after the sugar free ginger beer one and found the lid to be much easier to put back on which was great. The bottle is a fantastic bright and vibrant purple and it really stands out. 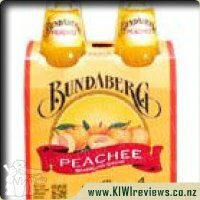 Its bang for your buck in comparison to some of the other brands which is great ..... and taste wise its fantastic! I used some of the soda stream fizzy blackcurrant in an ice cream spider drink and it was great! the combination of vanilla ice cream mixed with the drink created a really creamy blackcurrant flavour which did the trick for an after dinner treat. I did this after the children were in bed, but I am going to make it again one evening so they can enjoy it too. Upon reading other reviews of this, I hadn&apos;t even thought of mixing this syrup with hot water (un fizzed) so I tried this as often in winter hot blackcurrant is a favourite of mine. It was an absolute success! The cap gives you handy measurements for a single drink. When I measures this and it in my mug, I thought there wasn&apos;t enough but I played by the rules and used only as much as I was told, and surprisingly it was full of flavour! I can see this bottle would go further in hot drinks than other brands I usually buy. Blackcurrant Soda Stream will defiantly be on my shopping list again. Its very versatile, cheap and super yummy!! 10/10 from me on this one! What a winner! Given the chance to try SodaStream Blackcurrant, my tastebuds tingled in excitement blackcurrant is a taste I really enjoy. SodaStream had some fierce competition as I&apos;m a Ribena lover but WOW! I must say upon opening the bottle and have the sweet, sickly, colour appealing blackcurrant smell hit my senses I quickly poured myself a drink and sat down to enjoy. Enjoy I did it hit all the right spots/senses and I was soon getting up for a refill. I also tried this in hot water as I needed warming up and was delighted to find this fitted the bill in all departments. I will definitely be buying this again. Price wise this is going to be a very economical way to satisfy my tastebuds all year round. 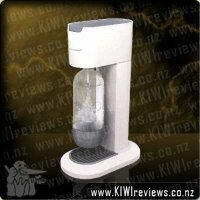 I will also be recommending this to family and friends who have a SodaStream machine in their home. 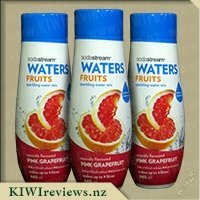 I was keen to try this as I am not a huge fan of Blackcurrant drinks but I&apos;m always happy to try something new, especially when a few of the sodastream flavour range have surprised me with their taste. My first thought when I opened the bottle up was that there was no doubt that this is Blackcurrant flavoured. So I was quite excited to see how this would taste once added to the bottle of fizzy water. I liked it, but it isn&apos;t one that I am in a rush to drink again. The flavour was great, but I don&apos;t think it really suited being fizzy. Instead, I just added some of it directly to unfizzed water and it tasted a little bit better. I ended up giving the rest of the fizzy version of the Blackcurrant to my children, which was a real treat, and was gone in almost no time at all. 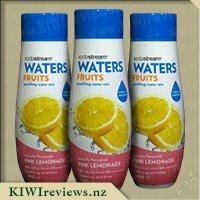 Whilst it is a nice flavour and you get bang for your buck, I don&apos;t think that I would buy this again unless it works out to be cheaper than Ribena. 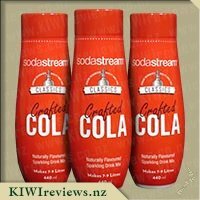 I am a real black current fan so this was a great addition to our stash of soda stream flavours. It is very, very sweet and was just like a fizzy Ribena. The overwhelming taste is of sweetness and black current so this is a real winner for me. Because it tasted so sweet though I could almost see the calories transforming onto my hips so I wouldn&apos;t drink a lot of this at once. I would actually drink this in winter over a lot of the other flavours though as it is a nice comfort drink. 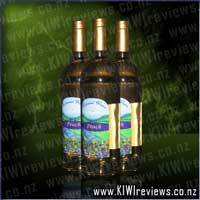 Price wise I would pay this as it is cheaper than a lot of the other flavours so comparatively good value for money. I can&apos;t see this bottle hanging about in our fridge unused so it is a product worth buying in our household. If you like black current then this is definitely worth a try. Did you say blackcurrent? Dont mind if I do. Out of all the syrups in the supermarket I always buy blackcurrent, Im a sucker for it really. 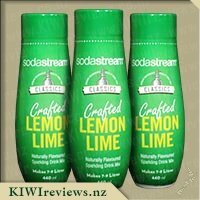 When there was a chance to review the sodastream blackcurrent flavour i jumped at it, one I have the soda stream machine and two I love blackcurrent. It smells really good like berries and all, and the taste is great just on the syrup alone, yup i keep running my finger along it tasting the syrup. Adding it to the nice fizzy water just is good too, just gotta work out the fuzziness for you, I found I dont like this when its too fizzy but i like it when i have pumped the machine about 5-6 times and thats how i like the blackcurrent one. 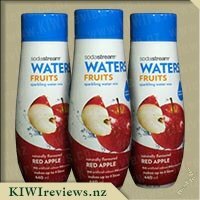 Its got a taste like something ive had before Barkers, but you dont have to use much of the soda stream one to make a litre which is great and its yummy for the whole family and those guests that like to turn up. Again the bottle for the flavour syrups are great, love the pictures on the bottles add to what the flavour actually is, and the colours match it too. 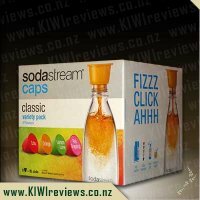 I love that the lid is able to be used as the measure to pour the syrup into the fizzy water.. Just love this flavour give it a go, you might to. I love blackcurrant drinks hot and cold so I wasn&apos;t surprised to see Sodastream had put a blackcurrant syrup out. Although it is part of their naturals range it is full of fruit juices including 5% blackcurrant juice concentrate. It doesn&apos;t state what the vitamin C content is and I would be curious to know how it compares to other blackcurrant drinks. I first tried it as directed with chilled carbonated water. It just didn&apos;t seem right. It was like it was an RTD. My kids didn&apos;t seem to mind, they love anything from the Sodastream machine. Today I tried it without carbonating the water. I much preferred it this way and the kids didn&apos;t complain as they downed their glasses. Tonight I had the syrup my favourite way, as a hot drink. Thankfully the lid has measurements for 250mls and 500mls along with the big 1 litre bottles. This made it very easy for me to add the correct amount of syrup to my mug. The hot water really bought out the smell of the blackcurrant. For someone like me that doesn&apos;t drink tea or coffee this an ideal winter warmer. I will be buying this syrup again to make both a chilled and a warm drink but don&apos;t think I will use it with the machine again. My daughter&apos;s favourite drink is apple and blackcurrant juice, so I thought I would enlist her in trialling this syrup. I fizzed up some water and then prepared this as directed on the bottle. I gave her a small glass full. She took a sip or two and thanked me for it. I asked if she liked it and she said "not really". This didn&apos;t surprise me too much as she doesn&apos;t really do soft drinks at all. It took her about 3 years after trying her first lemonade to actually enjoy it enough to drink a full 100 mls in a sitting. I on the other hand really like blackcurrant flavoured drinks. I enjoyed this drink very much, and I can say that my bottle is almost empty. I did find that, as directed, the drink came out very sweet. When I fiddled a little with the mixing, a little less syrup produced a nicer drink for me. It was still full fruit in flavour, but just less of a diabetic&apos;s nightmare. I love that the syrup is made up in part with real juice. Though I do like to avoid artificial sweeteners where I can, and this has a couple in it. It did have the added bonus of not tasting of the sweeteners which was appreciated. This tasted a lot like fizzy Ribena. 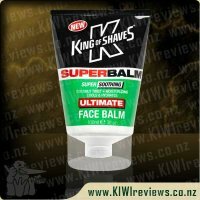 I&apos;ll definitely be looking out for this in the shops when I run out.